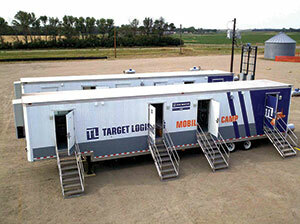 Target Logistics has launched a brand of mobile crew camps. The crew facilities are designed for operations that relocate frequently and need rapidly deployed housing solutions. The units are self-contained, movable and easy to permit and are expected to result in greater productivity, lower attrition and fewer onsite accidents. The North Dakota Petroleum Council (NDPC) has recognized Williston Mayor Ward Koeser and Whiting Petroleum District Supervisor Blain Hoffman for their service to their communities, state and industry. Each were given the Outstanding Service Award, an annual award given to a public servant and an industry representative who goes above and beyond their duties and obligations. Koeser has served as mayor of Williston for 18 years and Hoffman has worked in the oil and gas industry for over 40 years. The Sanford Health transplant programs in Fargo and Sioux Falls have been awarded the Bronze Award for Transplant Programs and the Bronze Medal of Honor for Organ Donations from the Department of Health and Human Services (HHS). The transplant award considers quality and mortality rates among other factors and has positioned Sanford in the 23 percent of transplant programs across the country. The organ donation award is given to organizations that have sustained national goals for collaborative conversion of organ donations. Exxon Mobil Corp. is expected to boost its holding in the Bakken oil field by 50 percent, spending $1.6 billion in the area. The company intends to buy the shale assets held by Denbury Resources Inc., acquiring 196,000 acres in the process. This will boost Exxon’s holdings in the area to 600,000 acres. North Dakota State University’s official fourth week enrollment for the fall semester is 14,443 students. This is a slight increase from the 201l fall enrollment of 14,399. Freshmen, transfer and undergraduate student enrollment have all increased while graduate and international student enrollment has seen slight decreases. Nearly all of the university’s students are in traditional, classroom-based courses.